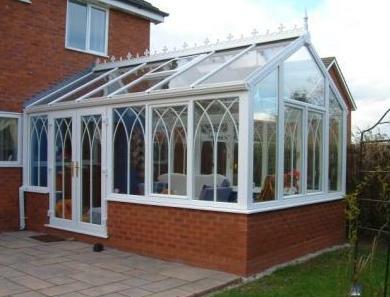 Gable Conservatories or Regency Conservatories? Gable Conservatories, as the name would suggest, are built with an angular glazed, gable front wall and are sometimes referred to as Regency Conservatories. 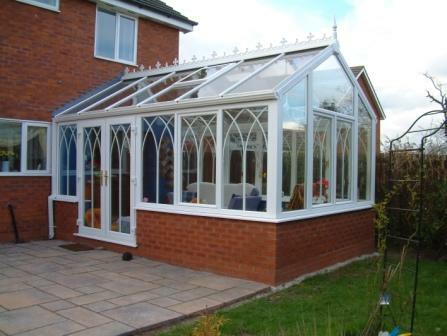 With the same rectangular floor space as Edwardian Conservatories but without the hipped front, Gable Conservatories have a continuous ridge from the house wall to the front of the conservatory. This forms a high, angled glazed front wall section, or gable, which creates a greater sense of space and height to the roof of Gable Conservatories. This also helps to keep your internal room brighter by allowing light to stream in from the high front windows – ideal for north facing Gable Conservatories where an internal room may otherwise be too dark. The high glazed angled window to the front is often decorated with a sunburst effect either using shaped PVCu profile or shaped Georgian bar between the two sheets of glass in the sealed units. The extremely versatile design of Gable Conservatories allows the roof to be built with a pitch as low as 15º or as steep as 35º. Further, when hipped back to a box gutter or built against a new tiled dormer, Gable Conservatories can also be built on to a bungalow. Most companies also offer a choice of finial and cresting to finish of the ridge of the conservatory – or you can keep it simple, with none at all. There are a number of conservatory roof companies which manufacture well engineered and well-designed conservatory roofs but at Just a Quote we tend to work with just a handful of them. They can go into much more detail during a survey but you can guarantee that all of the companies we deal with will have taken into consideration that in the United Kingdom most Gable Conservatories, during their first ten years will have had to cope with almost 30 feet of rainwater, 200 days of snow, and 3,650 days of temperatures ranging from 10º or 15º below freezing to, well at least sometimes, a hotter than average 35º. 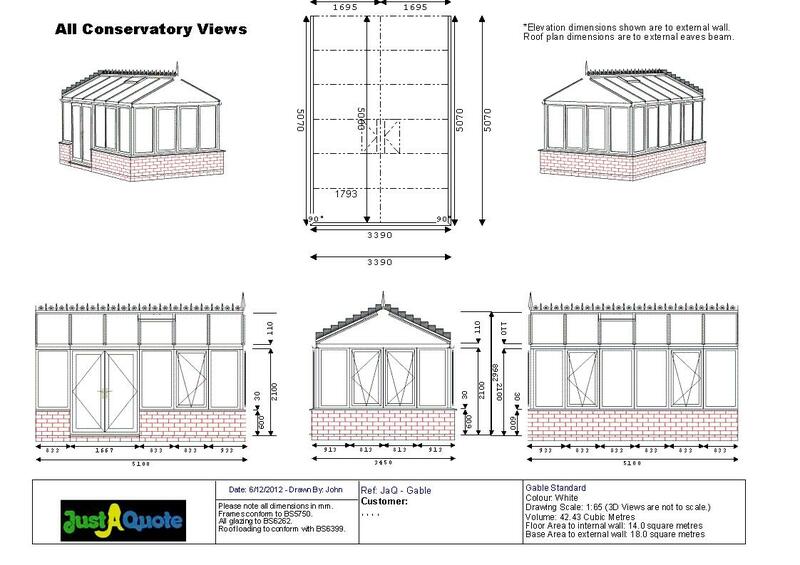 A surveyor can help you to decide not only on the style of conservatory which is right for you and your home, but will also help with the types of window and door, the levels of ventilation and insulation required, appropriate conservatory glazing and will offer other advice from planning permission to pricing. Most of the installation companies we deal with even produce scale CAD drawings and a superimposed image of Gable Conservatories onto a photograph of your home. Surveyors will advise on the use of casement windows, tilt and turn windows or sliding sash windows combined with single doors or double doors, sliding patio doors or bi-fold doors. Additional ventilation can be provided by either manually or electrically operated roof vents or proprietary ventilation systems which some manufacturers have designed into their roofs in the ridge and in the eaves beam. Conservatory designers also take into account the aspect of Gable Conservatories, as a north facing conservatory may need more insulation whereas a south facing conservatory will probably need more ventilation. 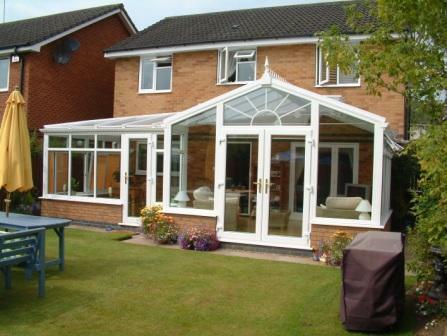 Additional protection from the conservatory overheating can be designed in, by recommending heat reflective polycarbonate or anti-sun glass in the roof. The intention is to ensure that all conservatories and orangeries are designed to be usable throughout the whole of the year. When considering a quote for Gable conservatories, don’t forget the finishing touches such as electric sockets, lighting, furniture and conservatory blinds. You may even wish to install paving around the conservatory, such as pattern imprinted concrete, block paving or a resin and aggregate surface. 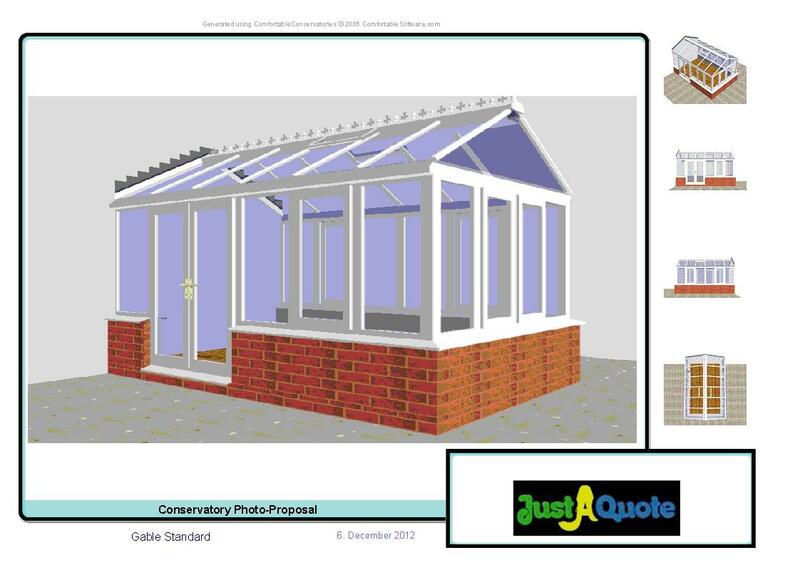 Just a Quote conservatory surveyors offer a CAD design service for Gable Conservatories and the following illustrations show the original design as a six image view, a computer generated image and the finished Gable conservatory as it was built.